General Overseer of R.C.C.G, Pastor E.A Adeboye Turns 74 Today! The General Overseer of the Redeemed Christian Church of God, Pastor Enoch Adejare Adeboye turns 74 today! 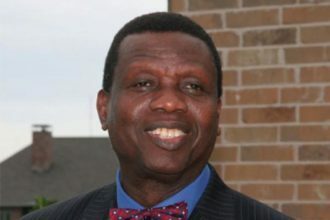 Pastor Adeboye holds a PhD in Applied Mathematics from the University of Lagos and was a lecturer at the University of Lagos and Ilorin before joining the RCCG in 1973. He was named General Overseer of the Redeemed Christian Church of God in 1991 following the death of the founder, Papa Akindayomi. The RCCG has, under Adeboye’s leadership, created thousands of branches within and outside Nigeria. In 2008, Newsweek listed Pastor Adeboye as one of the fifty powerful men alive. He is married to Foluke Adeboye who is also a pastor.